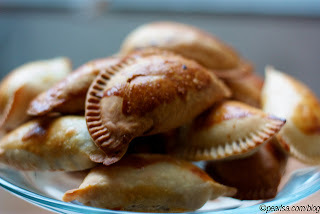 I was really inspired by The Taste of Morocco cooking class I took at Williams-Sonoma. So, inspired that I decided to give a Moroccan makeover to Italian Stuffed Peppers. I used an exotic Moroccan seasoning mix called ras el hanout and a grain that is new to me: millet, which is not Moroccan, ... but I have been trying to rotate grains in my diet because of my food allergies. Millet is actually a seed of a grass; so it is gluten-free, but we will call it a grain for simplicity's sake. Millet's nutty chewy texture is an excellent hearty winter grain. 1/4 cup gives you 20% of your manganese and 10% of your zinc and phosphorus which are good for your bones and nervous system. Drum roll please... I was floored by the results. To tell you honestly, I never was very fond of stuffed peppers. I kinda of tolerated the peppers, so I could enjoy the stuffing. Eating these stuffed peppers was the first time for me, the stuffing enhanced and complimented the peppers. The millet held up much better than rice. It didn't get mushy, and the seasoning and currants were exotic... but not threatening. Can I give myself a two thumbs up? Well, I'm doing it anyway... try these peppers...seriously try them. 1) Cook millet according to directions but add butter and 1 teaspoon of salt to it. 2) Preheat oven to 425 degrees. 3) In a medium size skillet saute onions in olive oil. When onions are limp add beef that is seasoned with 1 teaspoon of salt and ras el hangout. Cook beef until it is no longer pink. 4) Add cooked millet, currants, and lemon zest to beef and onions. Mix well. 5) With a teaspoon stuff peppers with mixture. Really pack the mixture into the peppers. They should be bursting with filling. 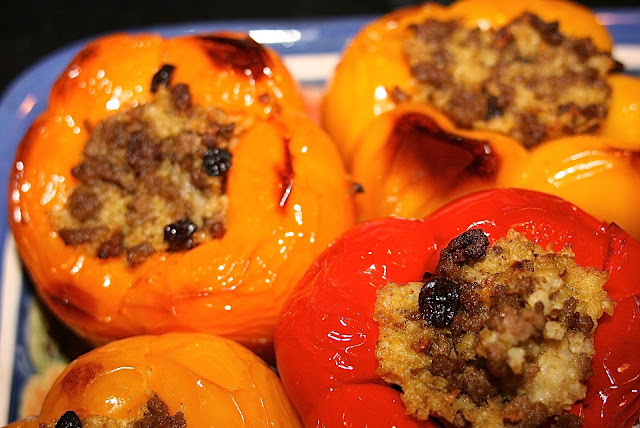 6) Put stuffed peppers on a baking dish and spray them with olive oil. 7) Bake for approximately 25 minutes or until the peppers are tender and spotted brown. 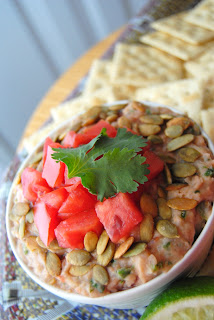 This is the healthiest, lowest calorie, most flavorful dip I've come across. Taste another place...Pho is a Vietnamese staple. Especially in the winter this sweet and salty soup adds warmth and excitement to a dreary day. I LOVE stuffed peppers, but as I'm a vegetarian I substitute the beef with grounds soy-beans. So glad to see you. Your layer cake was quite a hit on the food party circuit last week. What a winner. If you haven't made stuffed peppers with these spices please try it. I think you especially would really enjoy them. These peppers sound wonderful! Pinned to try! Thank you for the party, Diane! They were... if you are hungry for a different seasoning definitely try some Moroccan spice. I'm definitely trying these peppers one day! They look amazing. I bet they taste amazing as well! Julie you are adventurous... you'll love the seasoning. Those Peppers look awesome, can't wait to try them. Looks like you'al are really in for some bad weather this weekend. Stay warm and thanks for hosting! They say it could be an "historic storm" just what we need another "historic storm" but this time snow. Thank goodness we got a wood burning stove in case the power goes out again. So, I've attempted stuffed pepper but they've never gone over very well. They were just a little too "peppery" for us. You have me intrgued though with the morroccan stuffing. My kids are not super into the pepper part, but they loved the stuffing. My son wants me to make burgers with the Moroccan seasoning. It's really good. Then you will really like this recipe Angela, because I didn't like stuffed peppers before I created this dish. Check out the Moroccan spice really awesome with beef and lamb. Great stuff shared here again! Thanks for hosting! And you help make it so, thanks for being part of this party every week. You are most welcome. Love your recipe... thanks for being a part of foodie friday. I'm with you - I've never been a big fan of stuffed peppers, not that they don't taste good, but they are rather one note. However, these sound like they have a depth of flavor and textures. They I would definitely like. Love the use of millet and currants! I know I haven't done Foodie Friday for a while, but I'm back. :) Thanks for continuing to host it and have a great weekend! Glad to have you back. From what I recall of your recipes you will like these pepper. Truly different. Really one of the best recipes I've come up with in a long time. You are very welcome Lynn, thanks for stopping by. You are very welcome, so glad you joined us again. Just stopping by to let you know that I'll be featuring your recipe on my Favorite Finds post tomorrow morning! Have a great evening. Wow, thank you so much Julie. These stuffed peppers look wonderful! Thank you Diane for hosting the party. Have a wonderful day! I was lucky to visit Morocco a couple of years ago and loved the food. You can bet this is a recipe I will be trying. Thanks! What an adventure that must have been. I would love to go there and I know I love the food. These look awesome. My grandma makes stuffed peppers every summer because she ends up with so many from her garden. Thanks for sharing at Must Try Monday. Oh the honey has been looking for something different to stuff his peppers with! Thanks for sharing. Oh, he is really going to love this. I can't tell you how good this spice mix is with beef. I think millet is an unexplored grain for gluten-free eaters. It is definitely great for the winter: heavier than rice but lighter than barley. Oh Judy, I hope you give it a try. I was really impressed with the results. Lots of fabulous food at your party! Hope you are having a great Valentine weekend and thank you so much for sharing with Full Plate Thursday. These look delicious! We are featuring this recipe at Wonderful Food Wednesday this week. We hope you'll stop by and link up some more fabulous food! Kerrie thank you so much. I know what high standards you have at your party. I am honored. I think the stuffed peppers are great but I am more excited about the Moroccan spices. I have to look carefully, in the stores. I have not seen these but maybe that is because I wasn't specifically looking. Thanks for sharing in the Recipe Box. Yes the Moroccan spice mix is wonderful. I think you do have to really be looking. I found it mixed with the McCormick's spices alphabetically. I have become one.. love their seasoning amazing. Would love to visit this country.